Though today they're known as the Oktober Guard, when the Soviet super-team was first introduced, they were called the "October" Guard. Why the change? Simply, to make it more "Russiany." It's not like either spelling is correct: the actual Russian would be Актыябр (or Romanized to "Aktyabr"), but then, like Larry Hama said, nobody would have known how to pronounce it. The big Georgian fighter has plenty of strength and fighting skills, but he knows he's better off leaving the intelligence analysis to other members of the team. Just point him in the direction of whomever you want knocked down or taken out, and Horror Show will get it done with brute force and no wasted punches or stray rounds of ammo. He grew up in a well-known theater family and though he acted with them when he was a boy, he never wanted to live and work in a world of illusion. He likes his battles real and his ammo live, when all that stands between him and making it to the next moment is his ability to be the best fighter in the world. Horrorshow (identified for legal purposes in this set as Stepan "Horror Show" Drukersky) is the team's big lovable oaf. In his appearances on the cartoon, he generally seemed to be intended as a counterpart to Gung-Ho. He's wearing a thick quilted jacket (an all-new mold) and a leather skullcap, and is easily recognizable by his big handlebar mustache. If you think it strange that on a team of people who use their neal names, Horrorshow is known by an English phrase, then don't worry; he's (probably) not. It's likely they're actually calling him "Khorosho" (Хорошо), which is Russian for "good" or "fine." It was used the same way in A Clockwork Orange. Horrorshow is generally the heavy weapons expert on the Guard, so he comes with a big shoulder-fired rocket launcher like he often used in the comics. He's also got a black backpack (so you can re-create the story where Croc Master's pets ate it), and the AK-47 all the Guards tote around. The survival instincts of Sgt. Stalker were honed at an early age on the mean streets of his home town, a fact which gives him a distinctive edge over those who first received their combat training in their late teens under less demanding circumstances. He's no poser; he doesn't just walk the walk and talk the talk. He's the real thing, and he's taking names. Ranger trained and Airborne qualified, Stalker has gone through some of the toughest programs the Army can offer. He is resilient and resourceful, capable of adapting to changing situations and not hidebound by standardized procedures. He knows through experience that no battle plan survives the first shot and that the soldier who thinks the fastest on his feet is the one who will win the day. Boy, Stalker was really a popular choice for these comic packs, wasn't he? Only Snake-Eyes showed up in more. This version is wearing his classic uniform, a camouflage suit with a ribbed collar, suspenders and big boots. Oh, and his trademark beret, of course. The head is the same used in Comic Pack #26, but the torso and arms date all the way back to the original figures in 1982. Stalker gets two weapons in this set, both rifles. One is a patriotic M-16 (gotta love how they picked the most nationally identified weapons from Russia and the US for this set), the other is some kind of futuristic pretendo-gun. Okay, no, we kid: it's based on the SA-80. He can hold both well, but he looks best with the M-16. Stormavik is a member of the elite Soviet Airborne Forces. He's a tough fighter and a loyal soldier. As alliances and borders shift in frequent and contradictory ways, he regards Colonel Brekhov, the head of the Oktober Guard, as a solid and consistent leader. He follows the core values of the colonel: justice, honor, and dedication to his fellow soldiers. His complete commitment to duty caught the attention of Colonel Brekhov, and his unflinching courage convinced the tough colonel that Stormavik would be a valuable member of the guard. Totally fearless, he lives up to his name and storms into a battle with no other thought than to win. Stormavik was thr October Guard's equivalent of Clutch, Flash or Zap: no, not in terms of tactics or skills, it's just that, like them, he blended in with the wallpaper and nobody ever noticed he was around. He uses the same body as Col. Brekhov did, but his head looks eerily like Bruce Willis. Wearing a Russian beret. Seriously, this may be the first Joe with sculpted crow's feet around his eyes. If you had any question he was Russian, the top of a striped shirt pokes out of his jacket. That's part of the stereotypical "Rooskie" look, right? Stormavik missed out on the big fur hat, though. Since his arms are molded in green and then painted, it ends up looking more like he's wearing pink dishwasing gloves than skintone. His weapons are an AK-47 (of course) and a pistol. 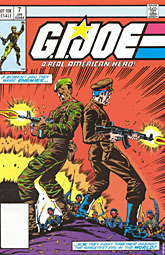 This set includes a reprint of GI Joe #7, the second half of the story included with the other Oktober Guard comic pack. Considering the cover so prominently displays Stalker and Brekhov, it's surprising that the Colonel wasn't included in this set rather than the previous one. It's a very striking cover, summed up by the blurb: "A moment ago they were enemies... now they fight together against the greatest evil in the world!" 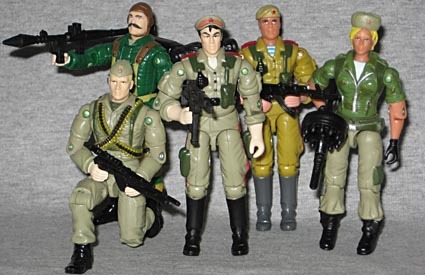 The Joes kind of come off like jerks in the story - yes, the Soviet Union was our enemy at the time, but it's sill strange to to see the good guys abandoning the Oktober Guard in a Cobra base as soon as it's convenient. "Yeah guys, thanks for the help; sorry we've got to leave you pinned down by enemy fire, but we have to steal the plane that rightfully belongs to you. Best of luck!" Although, maybe it's not so bad: Cobra is notoriously easy to defeat, even when they seem to have the advantage. Out of the two Oktober Guard sets, this one is probably the weaker: the figures are nice, but this one only has two new characters, whereas the other had all three. It's a shame there were only five members of the Oktober Guard when they debuted, because it meant one of the comic packs had to get short-changed.